Hotel Jen Tanglin Singapore officially reopened its doors last month after a massive refurbishment, and its all-day dining restaurant J65 is quite a showstopper with its scrumptious gourmet offerings. 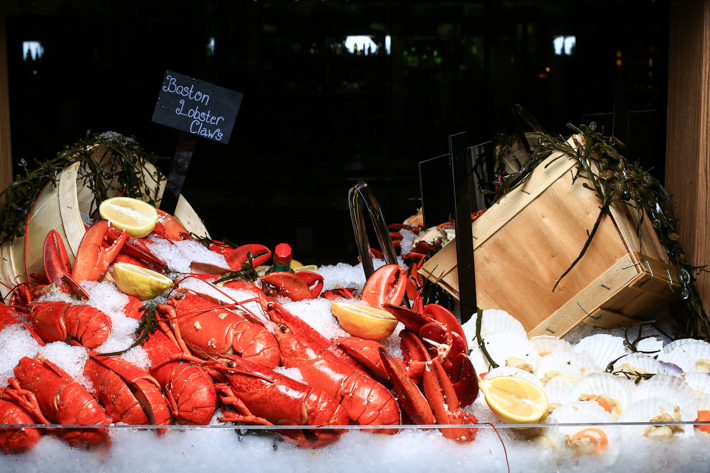 J65′s Sunday Brunch offers an unrivalled dining experience, and it is one of Singapore’s most value-for-money buffet spreads – at S$88 nett/pax (without alcohol), or S$128 nett/pax (with free-flowing Champagne, wine, beer and cocktails). Tuck in to unlimited servings of superbly fresh seafood, premium Iberico ham, roast prime ribs, local dishes, endless sushi and desserts. From now till Sunday, 28 Feb 2016, quote “ladyironchef” to be entitled to S$50* off Sunday Brunch at J65 with a minimum of two paying adults. Which brings us to our next point – our readers can utilise this offer and enjoy a stellar buffet at S$63 nett per person (if there is just two of you)! J65 is interestingly named after Singapore’s international dialling code and the spanking new restaurant will open throughout the day and into the night. With various themed meals taking place across the week, we have to say that it is the Sunday Brunch that will give you the biggest bang for your buck. Glorious feasts are finally made accessible to all. 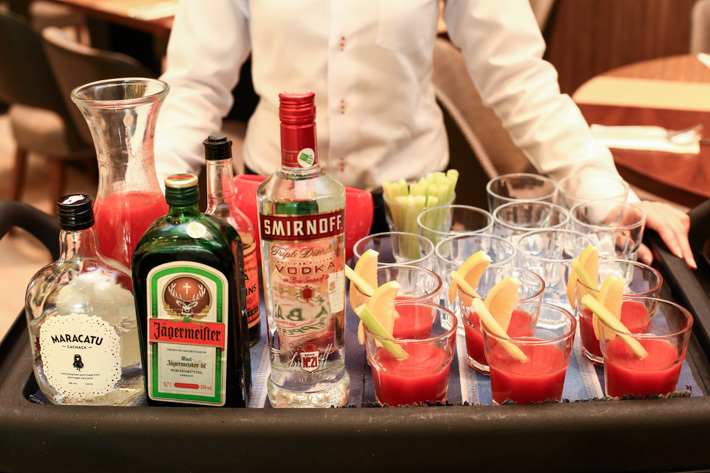 One may assume that an indulgent Sunday brunch buffet at a lavish hotel lobby might cost an arm and a leg, but that is certainly not the case at Hotel Jen Tanglin Singapore’s J65. 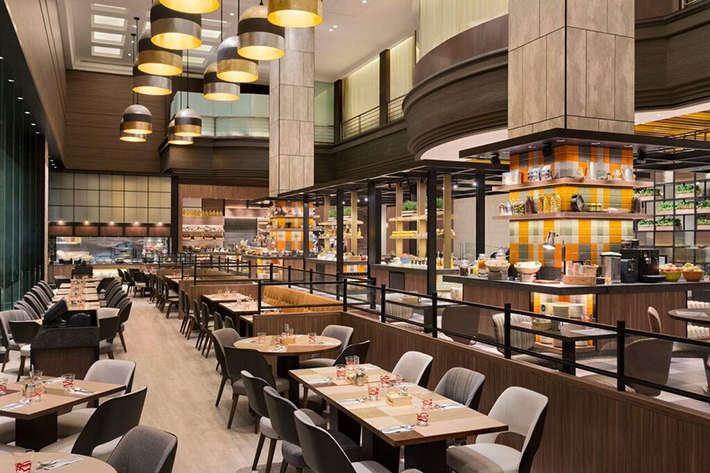 At S$88 nett, you can check in to a sumptuous feast featuring endless portions of delicacies. For free flow of beer, champagne, cocktails and wine, customers only have to pay S$128 nett each. High ceilings, live DJ performances, unlimited posh nosh and an option to top up for free-flowing champagne, red/white wines, beers and cocktails at a minimal fee? Count us in already. In efforts to support local talents and start-ups, Sunday Brunch at J65 is always accompanied by live performances by local musicians. From the Orchard Road street busker to young and aspiring professional singers – Hotel Jen Tanglin aims to be a platform for them to showcase their passion to an international audience. Needless to say, it was the ginormous sashimi display that we could not keep our eyes off. We all know how pricey premium Japanese raw fish can be. Featuring salmon, yellow fin and tuna sashimi, this station is an absolute paradise. And yes, they are handled professionally, met all hygiene standards and are kept at optimal temperatures that are safe for consumption. Meat lovers are far, far away from being neglected. Don’t worry, we hear you because we are the kind who would look out for the meat selections first upon stepping in. From the signature Sunday roast prime rib, pork pate, smoked chicken breast, beef stew to foie gras terrine, J65′s comprehensive variety will keep you busy. And we have to say that buffet lines usually do not impress with steaks/ roasts because they end up being too hard and dry from sitting around, but J65′s roast was actually still warm, tender and flavourful! It completely took us by surprise and we had seconds! Don’t forget to drizzle some Brown sauce over yours. There is an abundance of authentic Southeast Asian classics for those with Asian-skewed palates. Most people have a misconception that local fare only taste great at hawker centres, but wait till you try J65′s chicken rice! Take a pick from beautifully steamed and gloriously roasted chicken, and they will be accompanied with Malaysian-style rice balls. Can we also get you excited with the 6 different types of laksa? Yes, SIX – Curry Laksa, Johor Laksa, Penang Laksa, Sarawak Laksa, Singapore Laksa and Thai Laksa. No such thing as Laksa overdose because they are “same same but different”. J65 also has a salad bar that is so complete, the health nuts will go gaga over the several remarkable creations! You will have your nutritious salad mixes such as Wild Rice with cous cous, bell pepper and cream cheese, and the classic beetroot with pumpkin and spinach, topped with Blue Cheese. You know what else we love about this counter? The big buckets of juice bottles that is on free flow too. Cold-pressed juices all packed and ready for your consumption – think orange and carrot. Something with a local kick? Yes, you’ve got the soya bean milk with grass jelly, or what we all endearingly know as ‘Michael Jackson’. Cheese connoisseurs, it is your time now. Here we go – Brie, Emmental, Gruyere Cheese, Hard Cheddar, Manchego, Morbier, Parmesan, Stilton Blue and Tete de Moine. With complementing crackers, nuts and dried fruits too. 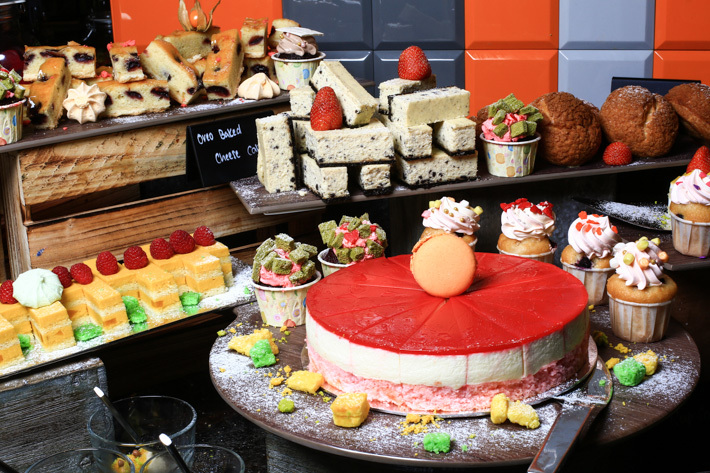 The dessert buffet is clearly a crowd pleaser, boasting a phenomenal line-up of sweet treats that it was as if we stumbled upon Charlie and the Chocolate Factory! 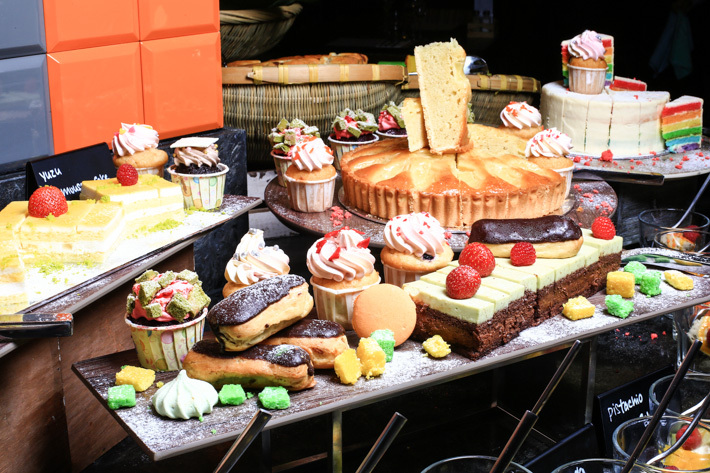 No joke – this is easily one of the biggest dessert counters we’ve seen among all the Singapore Sunday brunches! We can’t possibly name them all, and we didn’t have space to try them too. But for those that we did and loved, they are the cherry almond tart, chocolate ice-cream, oreo cheesecake, rainbow cake, yuzu mousse cake, raspberry lychee cake and Pina Colada. A good range of nyonya kuehs are part of the repertoire, too! Kueh lapis, kueh dadar, kueh kosui… just eat! Remember to quote “ladyironchef” to enjoy S$50* off Sunday Brunch at J65 with a minimum of two full paying adults. Note that this exclusive promotion is valid till Sunday, 28 Feb 2016. * Not valid with other offers and discounts. An advance reservation is required. And if you do not have time on Sundays, there is a weekday lunch buffet starting from S$29 nett and onwards too. Extremely reasonable, yes? Make your reservations at J65, Hotel Jen Tanglin Singapore. This post is brought to you by Hotel Jen Tanglin Singapore. Hi erm may i know where do i use the quote? Do i use it when i book online in the additional infomation section or the day itself when i am paying? Sorry i am new to this and Thankyou for the wonderful post! @TCC Hello, if you are calling the restaurant to make a reservation, do tell them the quote so that they can make an indication. And when you are there for the buffet, please let the staff know before you start the buffet. Have fun and eat more! Hi! Can i use the quote if i were to do an online ?reservation? Or is it only for phone reservation? @Jun Hello! If you are making an online reservation, please tell the staff the quote when you are there for the buffet.